By Jennifer Burcke on January 9, 2012 Visit Jennifer's Website. by Jennifer BurckeEggs are a very precious commodity here at 1840 Farm. It has been almost a full year since our flock of heritage hens began laying eggs, yet the excitement of discovering an egg in the nest box hasn’t diminished at all. In fact, we still bring each egg into the farmhouse to weigh them individually and log the information into our daily farm journal. Each egg is a small farming victory, a reminder that we have produced fresh food for our family table. As a family of farmers who raise chickens but don’t eat chicken, the eggs produced in our coop have an even greater value. We don’t raise birds to grace our farmhouse table although I greatly respect those who do. Instead, we raise birds to produce the fresh eggs that take center stage on our breakfast, lunch, and dinner plates. So, there we were in November, preparing to enter the holiday season with fresh eggs at hand. Suddenly, we started to notice an abundance of feathers floating around the coop. Every day there were more and more of them. By the time a few days had passed, the run underneath the coop looked like the aftermath of a full-fledged slumber party pillow fight. I knew what these piles of feathers meant, but I wanted to go on being blissfully unaware of the transformation that was taking place. We had noticed a decrease in egg production before the feathers began to cover the floor of the coop. We had remarked to each other that the hens were looking a bit haggard. I had even allowed the word “molt” to cross my reluctant lips. Deep down, I was hoping that the decrease in egg production was simply a response to the change in season and the decrease in daylight hours. Deeper down, I was afraid that our second winter as chicken keepers might be another winter of my discontent. No matter my lingering suspicions, I was still shocked when we had our first day of production that didn’t actually include any production. There were no eggs in the coop in the morning. Around noon, I confidently marched out to the coop hoping that at least one egg would be waiting for me. No such luck. Several hours later when I went out to secure the coop for the evening, the nest boxes were still bare.I told the hens good night and went back into the house. My family, as usual, asked how many eggs I had retrieved from the coop. After shedding my winter coat, I relayed the sad information that there were absolutely none. We talked about the fact that we hadn’t had a full day without a fresh egg since that glorious day back in February when we discovered the very first egg produced at 1840 Farm. Suddenly, the whole family was posing questions regarding molting. Unfortunately, those questions were all headed in my direction. As a chicken keeper who had just plunged unwillingly into our first molting period, I was having difficulty fielding their inquiries. I didn’t know how long the molting would go on. I didn’t know what we could do to help our hens stay healthy and warm during this transition. All I knew for sure was that our steady supply of deliciously fresh eggs had come to an abrupt, screeching halt. I went straight to the computer to learn all that I could about molting. 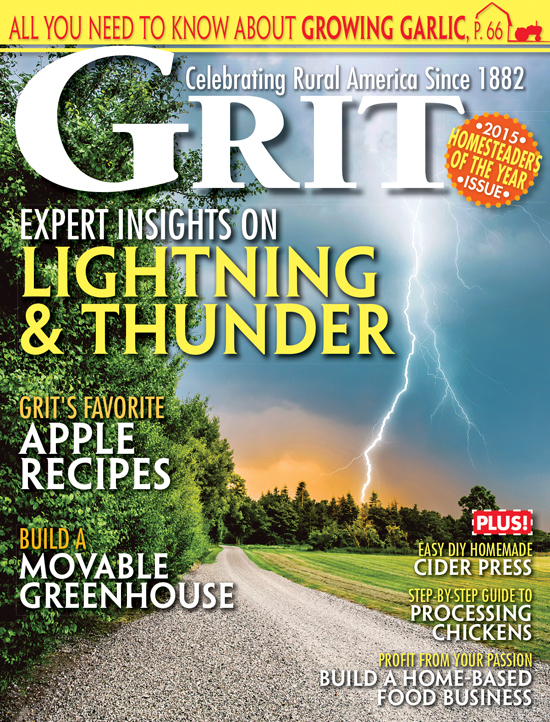 Luckily, there were several great articles on this very forum about the subject. I learned about the molting process from reading Meredith Chilson’s article. I read on to find that a fellow contributor, Rebecca Nickols, was also experiencing molting in her flock. I felt comforted to know that I wasn’t alone. At the same time, I felt powerless. What could I possibly do to help our birds emerge from this transition that Mother Nature had so cruelly imposed on them just as the weather turned perpetually cold? I continued to read all that I could about molting. Finally, I felt prepared when my family looked to me to solve our latest farming challenge. My children worried that the hens wouldn’t be able to stay warm with their compromised feathers. My husband worried that he might never know the culinary pleasure of having fresh eggs for Sunday breakfast again. I did my best to reassure them that this too would pass. I did my best to believe the words as I heard them coming out of my own mouth. While I now understood the biological necessity of the molting process, I still had my doubts that we would leave it behind without the loss of at least one of our beloved hens. Winter in New England can be bitterly cold and I worried that it would be far from kind to a chicken with little protection in the way of feathers. So began the daily march of molting season. Out to the coop I went with fresh, warm bowls of oatmeal every morning. I added extra yogurt and kefir to the mix, hoping to supplement the protein content of their morning meal. 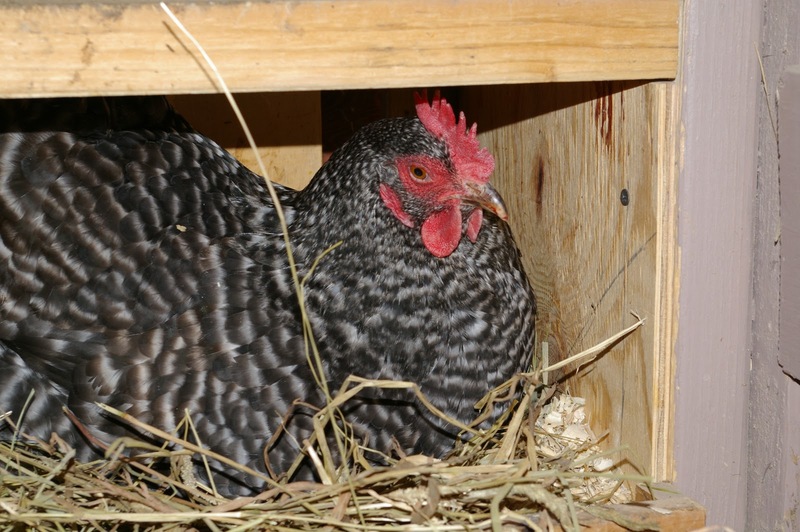 While I knew better than to expect to find any eggs waiting for me in the nest box, I felt like I was at least helping our hens to keep warm and boost their protein levels every time a steaming bowl of oatmeal was placed in the coop. It was obvious that molting was taking its toll on them. They looked ragged and their personalities had suffered as much as their plumage. 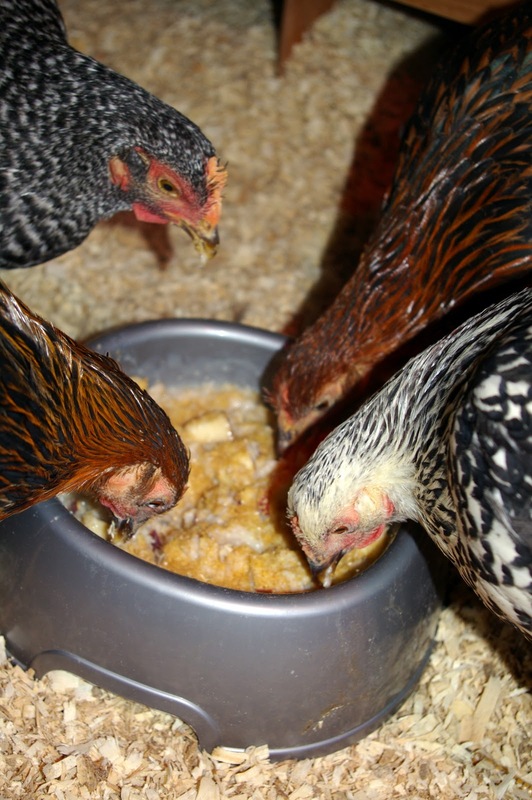 They were reluctant to eat their morning oatmeal, which usually caused a stampede to the feed bowl. They no longer rushed to greet me at the door when I came to check on them. Sometimes, I found their evening cereal still resting in its bowl the following morning. I knew for certain that they were as unhappy with their molting feathers as we were. It was obvious that the farmers living at 1840 Farm weren’t the only ones eagerly awaiting the regrowth of the last feather to complete this cycle and get back to the business of every day life. 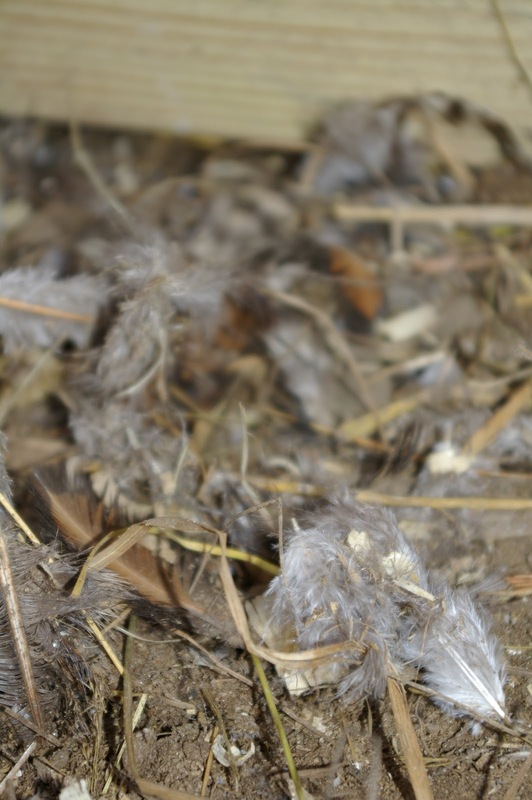 Each day our hens seemed to leave fewer feathers behind in their coop and run. After two weeks had passed, they began to look more like their former selves. We hoped with each small improvement in their feather condition that we were one step closer to reaching the end of molting. When they started to greet me at the coop door and race to gobble up their warm oatmeal I knew that we were within striking distance. I wasn’t taking any chances. 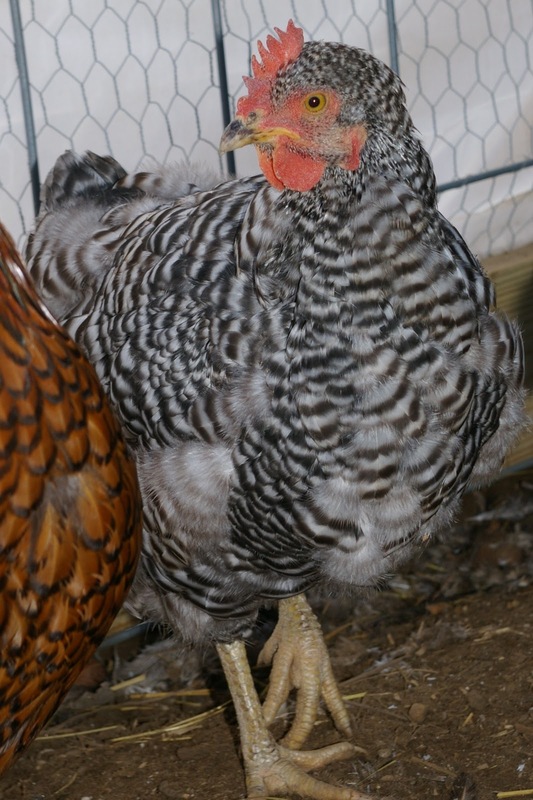 I had spent enough time reading about molting to know that there was something else we could do to literally brighten our flock’s days and get them back to the business of providing our family with fresh eggs. It was time to start providing light for our hens during the months that Mother Nature did not. Last winter, we had employed the use of a heat lamp in our coop. Our chicks were young and we worried that they would be unable to keep sufficiently warm during the long New England winter. We purposely chose to use a red spectrum heat lamp in order to allow them to sleep at night. It seemed to work well. The coop was slightly warmer yet they were unaffected by the red light and continued with their normal evening sleeping and roosting pattern. This year was different. We no longer needed to help heat the coop. Our birds were adults and unfazed by cold temperatures. We had specifically chosen breeds that were cold hardy and so far, those choices had proven to be successful. On even the coldest days, they rushed to go outside as soon as their ramp was opened. When given the choice, they chose fresh air over a warmer coop every time. Now our goal was not to add heat to the coop, but to provide pure light. We needed to make sure that they would recognize the light as a supplement to winter’s diminished sunshine intensity. We thought that we had the perfect answer: solar lights. We eagerly purchased two lights and began to charge them outside the coop. Every night, we placed the lit solar lights inside the coop. Every morning, we returned the lights to their outside location to fully charge for use the next evening. We were happy to be lighting the coop with renewable energy. It seemed like the perfect solution. That was, until we noticed how our chickens were reacting to the illumination provided by the solar lights.The sad realization was that they weren’t reacting at all. In fact, it was as if they didn’t even recognize that there was additional light within the coop. As soon as darkness enveloped our farm, they went to their roost and settled in for the night. It didn’t seem to matter to them that the solar lights were shining brightly and that we were doing our best to extend the daylight hours within the confines of the coop. They were not impressed. I was puzzled by this behavior. I decided to bring in the big guns. I enlisted the help of my family to run an outdoor heavy duty electrical cord from the barn to the coop by burying it in a length of PVC pipe underground. Then we reinstalled the old assembly for the heat lamp we had used when our hens were young chicks. 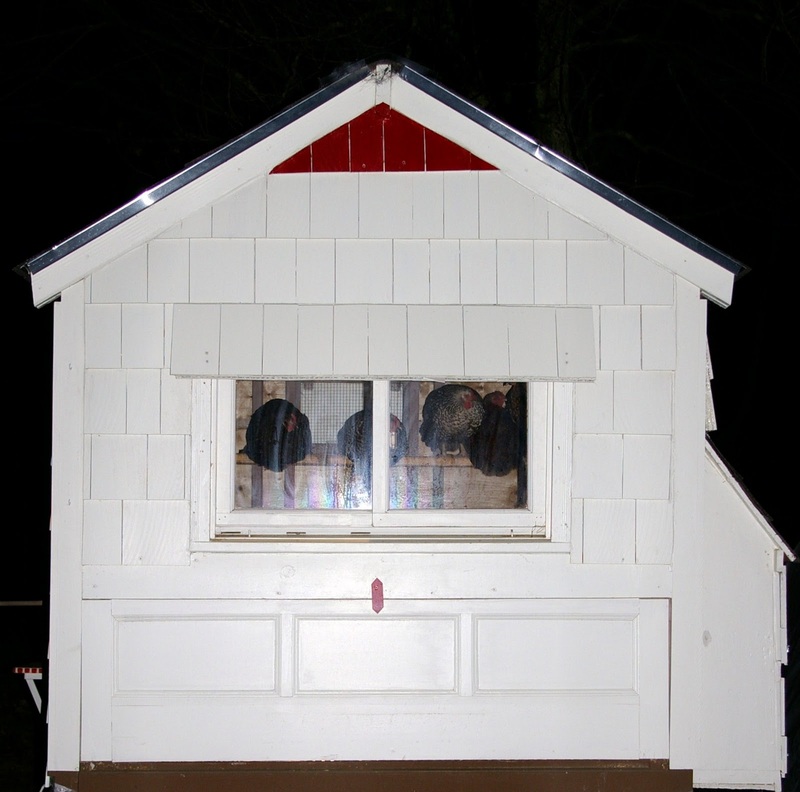 We connected the cord to a timer and set it to illuminate the coop for seven hours each day from noon to 7:00pm. I installed a 9 watt compact florescent bulb and waited to see if our hens would appreciate the light that this setup would give them. That evening, I went out to the coop for my nightly visit. Hedwig, our Black Australorp met me at the door. She couldn’t wait for me to come inside and scratch her on the head. I was happy to see that she was enjoying the new lighting. She is by far our most prolific egg layer and if I was only going to make one hen happy, she was the one I was aiming for. I wasn’t prepared for the rest of the hens to come running to meet me as well. They all gathered at my feet and allowed themselves to get caught up in the excitement that treat time brings. It was the first time in a month that they had reacted that way. I gave them the attention they wanted along with the cereal that makes me such a popular nightly visitor to their coop. I happily bid them goodnight and secured their door. Three hours later, I went out to the barn for my evening milking shift with our dairy goats. As I passed the coop, I peeked inside wondering what I might find. As I got closer, I noticed that the chain supporting their hanging feeder was moving rapidly. Sure enough, our seven hens were up and active in their new lamp-lit coop. Five of them were gathered around the feeder happily picking through their feed. One was scratching around in the hay on the coop floor. From the window, I couldn’t locate the seventh hen. I put down my milking supplies and opened the coop door. As I peered inside, the hens looked up from the feeder at me, wondering if I might have more cereal. They returned to the food at hand and the feeder was soon rocking back and forth between them. I scanned the coop. The remaining hen was not to be found on the perch, near the feeder, or at the waterer. She was in a nest box. She looked at me but refused to greet me. She was busy. She was laying an egg. I was all too happy to smile at her, thank her for her hard work, and close the coop door. As I walked to the barn, I could hear the happy sounds of the coop. Birds scratching the floor’s surface, birds eating, and best of all, a hen doing what hens do best, clucking while laying a fresh egg. When I returned to the farmhouse, milk in hand, I enjoyed the happy sounds of a chicken-keeping family. I was asked the usual questions regarding the status of our little flock. For the first time in weeks, I could happily report that they were back to being fully feathered and content in their coop. I put everyone on notice that there was a hen hard at work to bring us the first fresh egg we had seen in weeks. Excitement filled the air. Would there be eggs for breakfast? The next morning I went out to do my morning chores to find a glorious surprise. Seven fresh eggs were waiting for me in one nest box! Each hen had returned to laying. Each hen had made it through the molting process. That morning, each farmer had fresh eggs for breakfast. We were finally back to the business of family farm life. At least until next year. Great info here! Thank you for your very informative blog! One thing you could do differently is to have the timer set for earlier in the morning, rather than at night. This way the chickens find their roost naturally at night, and aren’t feeding and milling around when the light just shuts off. I agree that having a light on all the time is stressful on the chickens. Thanks again for your great blog! I, too, wanted to give my girls a little light for the long nights. I first reinstalled the light for heat in the top of their coop until the Feed Store specialist said the girls do not need heat anymore. I live in central Ca. and nights rarely get below freezing. So I rethought the situation. Since it was Christmas, I installed little Christmas lights around the outside of the coop’s roof and set them to glow from 5 pm until midnight. I also set the inside light bulb from 5 until 7 so that it provided light and not heat at night. My egg production began to return slowly. Once Christmas was past, and I didn’t want to appear insane, I change the lights outside to white led lights for the same time. I have 6 chickens and now regularly get anywhere from 3-5 eggs. (Can’t figure out which lady is not laying or laying every other day.) As the days become colder here during Feb. I will see if the technique still works! The additional light outside also allows me to look and see if everything is okay with my girls. My coop is inside a larger pen with hardwire so the ladies are not locked inside the coop and fully protected from preditors (I had to lose one chicken to learn that racoons like to kill chickens). Sometimes I see them outside eating at 9 oclock. Also, great blog! I will be back for more! I have a suspicion the LED “Light emitting diode” throws off a differant spectrum, maybe the chickens were not able to see it. Similarily, a red heatlamp is not noticed much by chickens, so thats why I think the solar lights with led’s in they didn’t work. Welcome to the world of chicken keeping! I don’t think that the city street light would be bright enough to disrupt your flock’s sleeping pattern. In fact, we have a dusk to dawn light on the peak of our barn which is close enough to the coop to light our walk to their door. That light doesn’t seem to have any effect on them at all. Sometimes if there is a full moon coupled with the barn light, I find it to be very well lit while our hens are happy (once their interior light has gone out) to go to their roost and wait for the morning sunshine to arrive and begin the day. I think that as long as your birds can roost in a location that is not brightly and directly lit that they will be able to rest peacefully. I hope that you’ll let me know what your hens think of their new chicken tractor and the street light once they make your backyard their home! What a wonderful article.I Am new to your blog. I will be getting chickens this spring and was wondering …………I live in town and where they will be going is my backyard in a chicken tractor., I have a city street light in my backyard that lights up the whole yard ………….will this help / hurt the chickens in thier laying as they will have light 24 hrs day ? thank you !! Our hens had a dramatic decrease in egg production for 14 days which was followed by a 16 day period when all seven of them completely stopped laying. We didn’t see a single egg during that time. 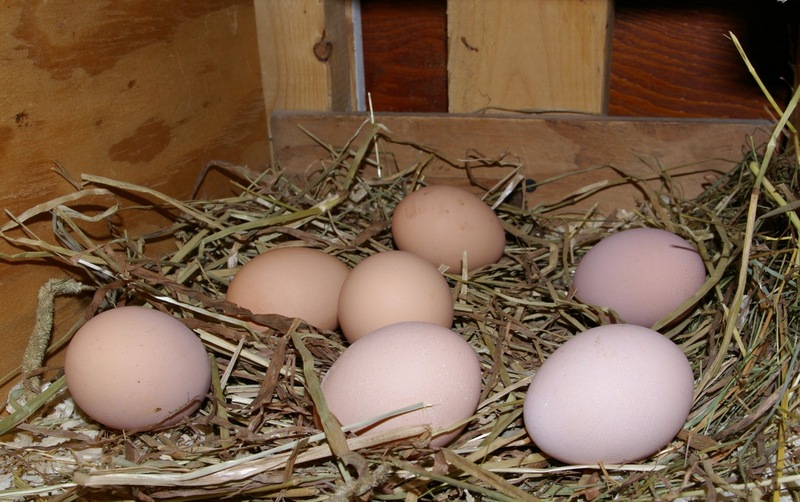 We found seven eggs on the first day which was followed by one week where their production was gradually increasing. Since then, they have been laying an average of 4.5 eggs each day. The eggs have been well formed with strong shells and quite large. We’ve had several eggs that weighed more than 70 grams with two weighing 74 grams each! How long was the molting / non-laying time span? Thanks! I am not sure why the solar lights were ineffective. We were using two and they provided plenty of light (in my human opinion) yet our hens much prefer the heat lamp housing with a CFL. I have read that providing light 24 hours a day can be stressful on birds. That is why we chose to use a timer. We are extending the daylight hours while still providing our flock a period of natural darkness so that they can rest comfortably during the night. 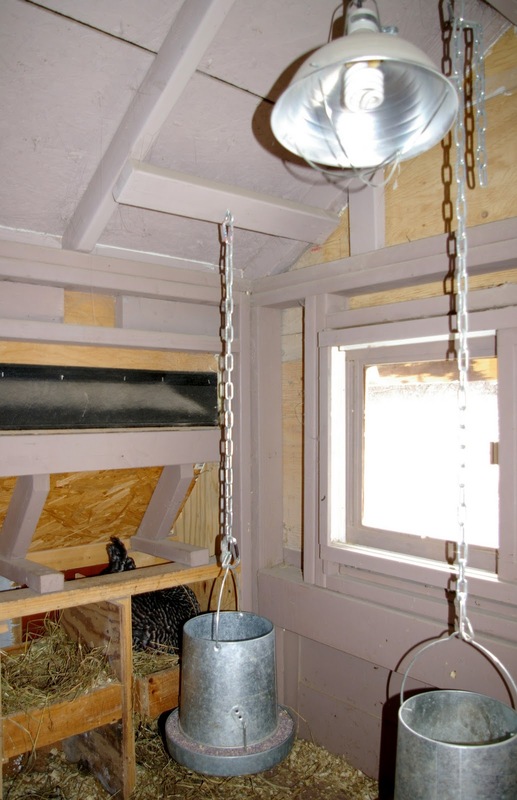 I would love to hear how your hens respond to supplemental lighting if you decide to give it a try. We had our 7 hens still laying the normal amount of eggs even through the cold snap in October (upstate NY) but then things dramatically slowed down in December for several reasons (I think). One hen disappeared (probably a predator), we introduced 3 new hens, and a second hen was attacked by something. I think all of this stress has taken its toll on them, that in addition to the fewer hours of light. I have heard that additional lighting can be stressful as well—that winter is a natural time for them to slow production—but after reading your entry here, I am thinking that your hens were almost relieved to have the extra light. I will consider adding a light, but I think running an extension cord is out of the question. Why do you think your solar lights didn’t work? Not bright enough? We have a heat lamp in our coop as well but are using just a regular 75 watt bulb. It was the easiest bulb to find locally. So far so good, all 7 hens are laying. We got them as chicks in late May of 2011 so they are still quite young. I just leave the lamp on all night, no timer. Should I have it set on a timer or at least unplug it before I go to bed at night? They all get up on their roost at night even with the light on so can I assume they are sleeping up there? As you can tell, we’re newbies! See, you were way ahead of me on the chicken learning curve! I didn’t grow up on a farm, so I am learning as we move along our journey as chicken keepers. I will now make sure that we always provide additional light as the days shorten in the fall. Here’s hoping that my children will (as you do) always remember to provide a little light for their hens in the fall and winter. Growing up on a farm, I’ve known for years that hens need 12 hours of light to produce eggs. I always turn on a light in the chicken house as soon as the daylight starts to be less than 12 hours. My hens lay all through the winter, and molting is delayed and staggered among the hens. Thanks for sharing your experience. How long was it between when they stopped laying and began laying again? Amazing that you had such quick results! Hooray! I have older girls and am still relying on “natural” light–but I’ve had eggs in nests 3 out of the last 4 days! Finally. Good article. This is a very interesting article, as I was not aware that hens would lay with flourescent lighting. I still don’t like them, but it’s good to know they will work for chickens if you need them. Thanks!